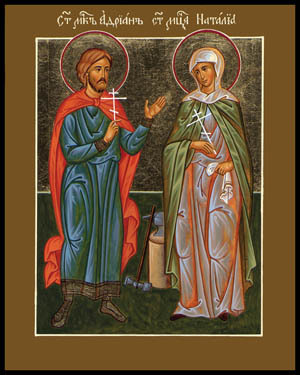 Thy Holy Martyr Mammas, O Lord, through his sufferings didst receive an incorruptible crown from Thee, our God. For having Thy strength he didst lay low his adversaries, and didst shatter the powerless boldness of the demons. Though his intercession, save Thou our souls! In truth thou wast revealed to thy flock as a rule of faith, an image of humility and a teacher of abstinence; thy humility didst exalt thee; thy poverty didst enrich thee. Hierarch Father John, entreat thou Christ our God that our souls may be saved. O Holy Mammas, do thou lead thy people as a flock to life-giving pastures with the staff which God gavest thee; crush the invincible and fierce enemies beneath the feet of those who doth honor thee: for all of those who art in danger receives thee as their fervent intercessor! ➢ The parish is looking to purchase new vestments for altar servers. Please give designated donation if you would like to contribute. We are still about $300 short. On September 6 we read Mark 5:1-20, which recounts one of the most dramatic of Jesus’ healing miracles. 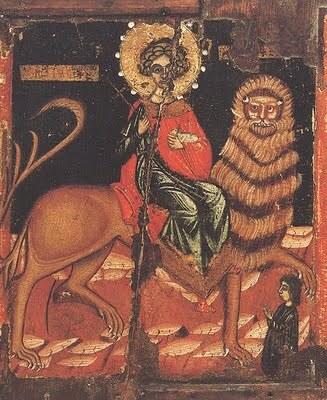 Also on this day, we remember the miracle of the Archangel Michael at Colossae. The story of the Archangel’s miracle begins with the gratitude of a pagan father. This man’s daughter, previously mute, was enabled to speak when she drank waters from a healing spring located near the city of Hierapolis. The father, desperate to find a cure for his daughter, had taken her to the spring after being told to do so by the Archangel Michael in a dream. Overwhelmed with thankfulness, the father and his family members were all baptized. 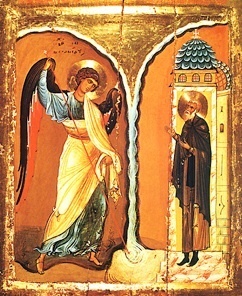 Then the father oversaw the building of a church dedicated to the Archangel. As the miracle became widely known, people with illnesses and disabilities began coming to the spring for healing. Some were Christians, some were pagans and idol worshippers, and it made no difference—the spring’s waters were effective for everyone. Many pagans who found healing at the spring followed the example of the mute girl’s father, accepting baptism into the Christian faith. They were encouraged by the example of a believer named Archippus, who lived at the church and served as its sacristan for decades. His unassuming manner, combined with sincere faith, made Christianity attractive to people who met him. But some pagans feared the growing influence of the church that so strongly symbolized Christ’s healing power, and decided to destroy it. They diverted a powerful mountain stream so that it would begin rushing toward the church and inundate it. Might we, confronted with God in person, also hope He would just go away?The healing doesn’t make people happy; in fact they are “afraid” and ask Jesus to go away. Perhaps even something as terrible as demon possession had become familiar, and frightened them less than having to see God’s love and power right before them in the Person of Christ.